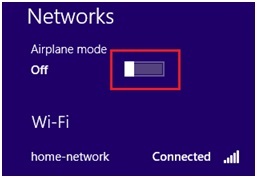 Airplane mode is useful feature in Windows 8 that allows you to turn on or off all wireless connections (wireless adapter, bluetooth, mobile broadband, etc) on your Windows 8 devices (laptop, tablet, mobile phone, etc) quickly with just one click. This is especially useful if you need to use your Windows 8 device on the plane or other location that don’t allow wireless communication. The following image shows how it looks like once you have turn on airplane mode, you could see that the network icon is changed to airplane icon on lower right corner of taskbar area. 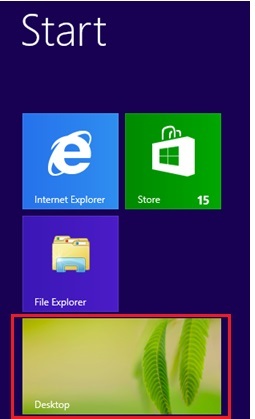 1) Click Desktop tile on Start screen in order to go to Windows desktop environment that you are familiar with. 2) Click the network icon on lower right corner of task bar area in order to show wireless network or other network information. 3) After that click on the Airplane mode bar on top of network list in order to turn it one. 1) On Start screen, move your finger or cursor to the upper or lower right in order to open the Charms bar, after that click on Settings charm. 2) After that click on the network icon and proceed to click on the Airplane mode bar on top of network list in order to turn it one. 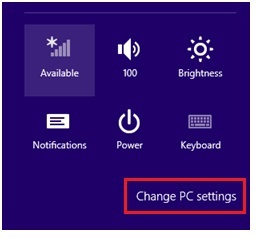 2) Go ahead to click on Change PC settings. 3) Proceed to click Wireless under PC settings and click on the Airplane mode bar to turn it on. Note: Sometimes your wireless adapter will be in disabled mode too once you have turn on airplane mode somehow, so don’t forget to check wireless adapter status if it doesn’t work after turning off airplane mode. If you are interested, take a look on this article to find out more. Return to top of "Quick Way to Turn On Airplane Mode in Windows 8"! !